Our printing press eats multiple page booklets and brochures for breakfast! It’s never been easier for you to print booklets – see our artwork guide for more information on preparing your own artwork. Portrait (vertical) booklets have the stitching and spine on the long edge. Portrait orientation is standard for most magazines, and is perfect for text and images. Landscape (horizontal) booklets have their stitching and spine on the short edge. The pages spread open a lot wider this way, and are perfect for large photos and a non-standard format. Free Delivery for all Booklets! Saddle-stitching uses staples (typically two) to bind the pages on the spine. This is an economical option for booklets as small as 8 pages up to 64 pages, in multiples of 4 pages. Saddle Stitching can produce a “bowing” effect in the centrefold of booklets with thick stock or more pages. Get an instant price for your saddle-stitched booklets at the top of this page. Perfect binding creates a flat spine for your booklets, using glue rather than staples to bind the pages together. Perfect Binding is perfect for magazines and thick booklets from 40 to 240 pages, in multiples of 2 pages. Get an instant price for your perfect-bound booklets at the top of this page. 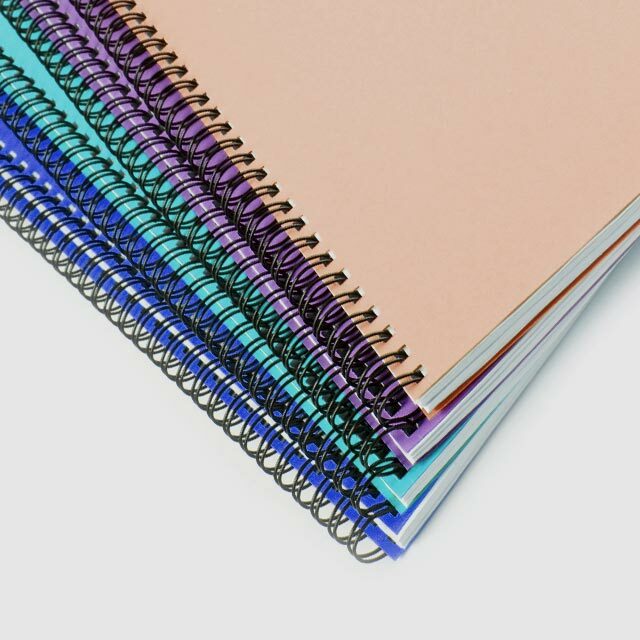 Spiral Binding uses a spiral wire to bind pages into a booklets such as reports, notepads and calendars. Not yet available in our Instant Quote form, please contact us for a quote. A “self-cover” booklet uses the same paper stock throughout the booklet, including the cover. You can opt to print your booklet with a “plus cover”, which means the cover has it’s own specs – such as a thicker stock, and may include special finishing such as celloglaze lamination and 3D-UV raised gloss varnish. 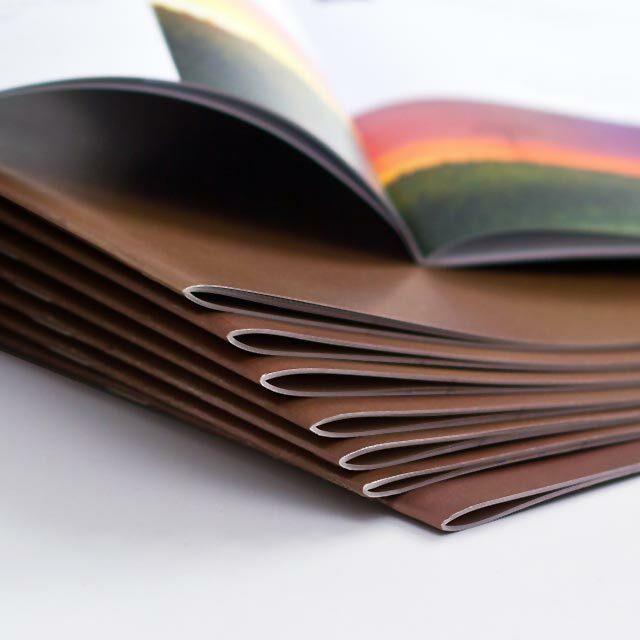 Saddle-stitched booklets can be printed as either a self-cover booklet, or plus-cover booklet. 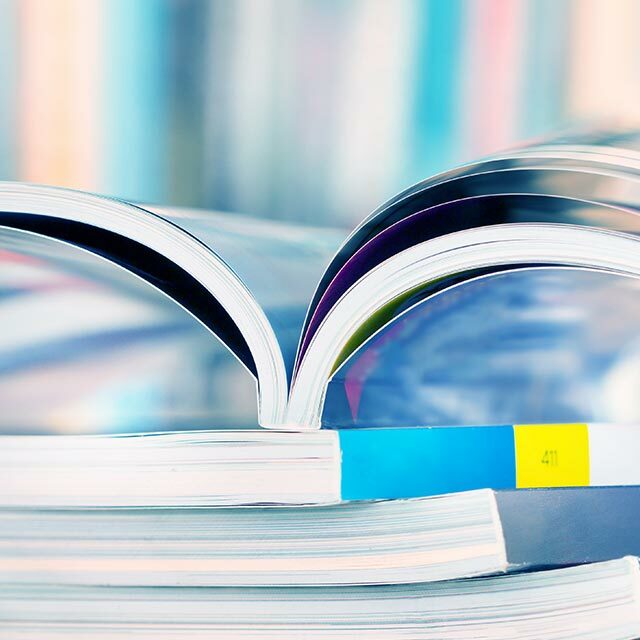 Perfect-bound booklets that have a spine are perfect for magazines and thicker publications are best printed with a plus-cover with a heavier stock. Annual reports are an essential part of marketing your company to investors and prospective customers or partners. The common and standard size for an annual report is A4, in portrait orientation. We can print up to 64 pages in a saddle-stitched annual report, or up to 240 pages with a perfect-bound booklet which has a spine. Allow plenty of room in your annual report for full-page photographs, graphics and charts. Giving the content space to spread out will make the booklet read easier, and look much better! “Self cover” booklets use the same stock throughout the document, including the cover and the inside pages. This option is usually cheaper than a “plus cover”. You can choose a “plus cover” for your printed booklets, where the cover pages are thicker than the inside pages. For example, your booklet may have 130gsm gloss stock on the inside “text” pages, but a thicker 360gsm card cover. A “plus cover” also lets you choose different printing options (colour vs black ink) and laminating options for the cover. The type of stitching or binding of your booklets can affect how many pages you can print. Use our Instant Quote form at the top of this page to see the options available to you, and what the price will be. Printed pages in multiple of four, eg 8pp, 12pp, 16pp, 20pp to 64pp. Printed pages in multiples of two, eg 40pp, 42pp, 44pp, 48pp – 240pp. If your printing only requires a single sheet of folder paper, then we consider this a “flat sheet” flyer and not a “multiple-page” booklet. We have a number of folding and scoring options for flat sheet flyers including trifolds and bifold flyers. 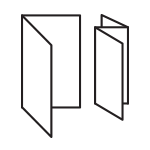 Browse folded flyers and brochures. Your artwork for printing booklets must be a single PDF with each printed page represented by one page in your PDF. For example, an 8pp booklet will need PDF artwork with 8 pages. Do not be concerned whether “page 1” will be on the same sheet as “page 8”; just provide all of the pages in order in a single PDF.